What is a Thermostatic Mixer Valve? A thermostatic mixer valve is an essential part of a well-designed shower. Safe, convenient and economical, it ensures maximum showering enjoyment while protecting you and your family from the risk of scalding. What is a thermostatic shower mixer? A thermostatic mixer maintains an exact water temperature for the duration of your shower. It protects you from any sudden changes in the water supply to the shower, so even if somebody flushes the toilet or turns on the kitchen tap the temperature of your shower will remain the same. How does a thermostatic mixer work? The thermostatic valve mixes the hot and cold water to your pre-selected temperature and reacts instantly to any changes in the pressure or temperature of the water supply by re-adjusting the mix of hot and cold water. Should there be a failure in your cold water supply, the thermostatic valve will automatically shut down. A thermostatic mixer valve offers three key benefits: safety, convenience and economy. Safety – Your pre-selected water temperature remains constant for the duration of your shower, so there’s no risk of scalding from a sudden temperature increase and no surprising shocks should the temperature plummet. GROHE CoolTouch® technology ensures the outer surface is never too hot to touch. Convenience – Our thermostatic mixers will maintain your pre-selected water temperature, leaving you to relax and enjoy your shower. Should you wish to stop the water (e.g. to shampoo your hair), the thermostat will automatically find the exact same temperature when you re-start the flow. Economy – Install a thermostatic mixer and you can save water and energy too. Thanks to their efficiency, a thermostatic shower mixer will pay for itself over a short period of time. Use our water-saving calculator to find out just how much you can save. Thanks to their outstanding performance and GROHE TurboStat® technology, our thermostatic shower mixers came out top in several Independent tests. Yes, if you want the perfect water temperature and a safe and comfortable shower for everyone in your home. 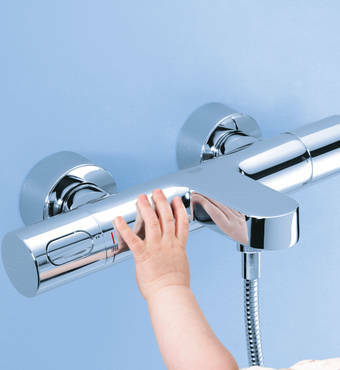 A thermostatic shower mixer is particularly important for households with children or elderly family members, whose skin is thinner and therefore the risk of scalding is higher. Are there different types of thermostatic shower mixer available? Yes, GROHE offers several different models to meet all your showering requirements. Our concealed and exposed thermostatic shower mixers and bath/shower mixers offer exceptional value at every price point, while our range of stylish designs coordinate with GROHE tap collections. Our collection of shower systems also includes several thermostatic models.